Through the new initiative, DCLA will award up to six grants of $50,000 each to arts and cultural organizations working in partnership with city agencies to address pressing civic issues. City agency partners must provide a minimum contribution of $25,000 to the proposed project, which may be in-kind. Applications are due on Monday, November 13, 2017. Proposals will be reviewed by the Mayor’s Office, DCLA, and outside professionals with relevant expertise. DCLA expects to notify applicants of the outcome of the process by mid-November 2017, with programs to begin as soon as possible thereafter. Projects funded by the Mayor’s Grant for Cultural Impact must be completed by the end of the City’s fiscal year on June 30, 2018. Applications must be submitted by the cultural partner. For FY18, eligible applicants must have submitted an FY18 Cultural Development Fund application or be members of the Cultural Institutions Group. Please review the guidelines carefully before submitting an application. Each cultural organization and city agency may select only one partner and may submit only one application. The selected artist will have demonstrated experience and excellence in socially engaged art or collaborative art practice addressing social and political issues relevant to the host City agency. Artists working in all media welcome to apply. Artists may apply to multiple open calls, but can only be selected for one position. A separate application must be submitted for each agency. View the PAIR applications with more information, guidelines, and eligibility. The deadline to apply is 11:59pm on Sunday, November 12, 2017. If you still have questions after reviewing the open call and guidelines, read the PAIR FAQs. Still have questions? Email PAIR@culture.nyc.gov. 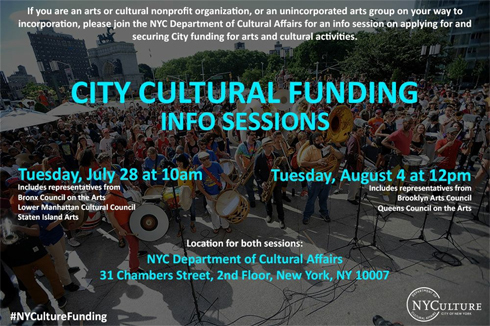 If you are an arts or cultural nonprofit organization, or an unincorporated arts group on your way to incorporation, please join the NYC Department of Cultural Affairs (DCLA) for an info session about applying for and securing City funding for arts and cultural activities. At each session, DCA will offer an overview of the Cultural Development Fund, which is the city’s open, competitive funding process for arts and cultural organizations throughout the five boroughs. In addition, representatives from the five Local Arts Councils will discuss their funding opportunities and array of services for smaller organizations and unincorporated collectives at the sessions noted above. BCA will be participating in a discussion about grant opportunities for Bronx organizations and arts groups at the NYC Department of Cultural Affairs on Tuesday, July 28th!